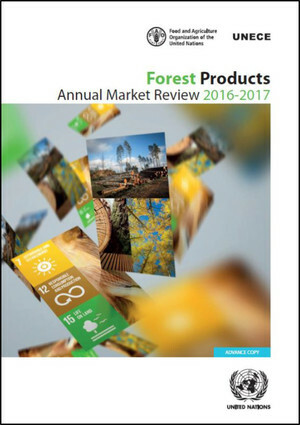 ECE/TIM/SP/41 The Forest Products Annual Market Review 2016-2017 provides a comprehensive analysis of markets in the UNECE region and reports on the main market influence outside the UNECE region. It covers the range of products from the forest to the end-user: from roundwood and primary processed products to value-added and housing. Statistics-based chapters analyse the markets for wood raw materials, sawn softwood, sawn hardwood, wood-based panels, paper, paperboard and woodpulp. Other chapters analyse policies, forest products trade barriert affecting the UNECE region, and markets for wood energy. Underlying the analysis is a comprehensive collection of data. The Review highlights the role of sustainable forest products in international markets. Policies concerning forests and forest products are discussed as well as the main drivers and trends. The Review also analyses the effects of the current economic situation on forest product markets. Read more.